This unique payment service will be made available on Amazon.in as well as its partner sites. Amazon wants to include both merchants and customers in it’s ecosystem; and this latest launch of payment solution is a bold step in that direction. How Will It Help Merchants? When the customer opts for this option of making payment, then he will be required to enter Amazon id and password, which will enable to use the system just like he uses on Amazon’s main portal. The saved addresses and debit/credit card can be used to make the payment, and the process simplifies. Amazon is pitching this new service for merchants with the slogan: “Make Amazon’s Customers Your Own Customers” considering that those users who already have Amazon account would be inclined to use the service to save time and for simplicity. With fraud protection from Amazon already available with this payment option, merchants may find ‘Pay with Amazon’ feature attractive. Marketing resources, graphics and integration code of ‘Pay with Amazon’ is already being provided on their website, making it even easier for the merchants to use this feature. 0.75% on transactions less than Rs 2000 and 1% on transactions more than Rs 2000 on Debit Cards. Once the promotional period is over, the merchants need to pay a flat fee of 3% on all transactions. Those customers who already have Amazon accounts simply need to login to their accounts when they are shopping on other websites, which have chosen to use this feature. Using one single login credentials, customers can shop from anywhere, with safety and assurance of Amazon protection against fraud. Additionally, the payment service would be available on mobiles and tablets as well, making the whole process smooth and easy. How Will it help Amazon? If both the merchants and customers use Amazon’s payment service, then Amazon will earn its commission, without selling a single item. But more than the commission, it’s the trust and branding which will assist Amazon. On one hand they will be partnering with merchants who are selling products on their own websites and on the other hand it will create a ‘habit’ for customers to use their payment platform, thereby creating an even stronger brand and online presence. 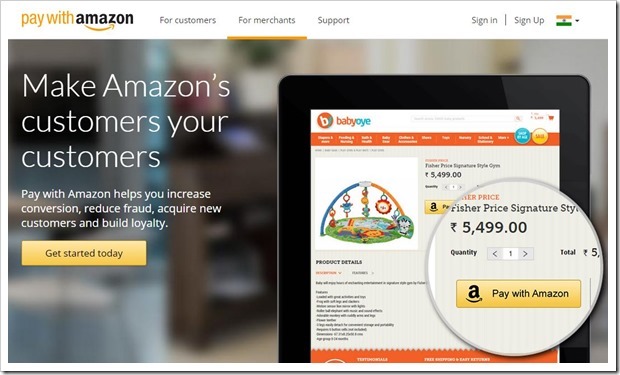 Will ‘Pay with Amazon’ feature excite the online merchants and their regular customers? Will it work in India? Do share your opinions by commenting right here! "Pay With Amazon: Amazon’s Own Payment Solution Comes To India", 5 out of 5 based on 1 ratings.